What does your child want to be when they grow up? 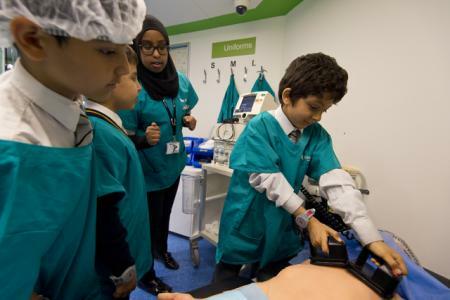 London's new family attraction, KidZania, lets them try out prospective careers in a child-centred world. 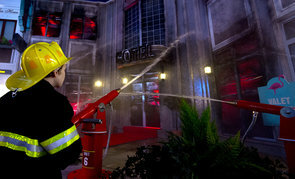 In London's Westfield centre, KidZania gives children the chance to try out a range of grown-up jobs. Lucy Dimbylow visited with her children Tom, 10, and Katie, four. The ultimate in role-play experiences, KidZania is a child-centred city where kids are in charge and can try out over 60 different educational activities. There's a wide range of jobs for the, to try out, from firefighter and pilot to radio DJ and chocolate maker, suitable for children aged four to 14. Grown-ups are strictly banned from taking part in the experiences, watching from behind glass, so that children can build their confidence and independence, and older children can explore by themselves while parents relax in the adults-only lounge. Each activity takes around 20 minutes, and children can usually fit in four to six different jobs in their four-hour visit. KidZania has its own currency – kidZos – and each child is given 50 at the start of their experience. To take part in some of the experiences, children have to pay (up to 12 kidZos) while others allow children to be paid a salary. At the end of the visit, children can spend their kidZos in the department store (adults aren't allowed in, so the choice of what to buy is entirely your child's). It's a great concept that's full of learning experiences and loads of fun. KidZania's experiences are mostly suitable for children aged four and over. The firefighter and paramedic activities were definite highlights for my four-year-old – outfits are provided, and the children travel to the scene of the emergency in working emergency vehicles. Other great hands-on experiences that are perfect for smaller chidren include the various food factories (chocolate, smoothies, ice cream and cereal bars), the special care baby unit where Katie got to bath, feed and put a 'baby' to bed, the art studio and the supermarket, where kids can either be the staff or the shopper, pushing their own trolley around and finding products from their visual shopping list. Under-fours can't take part in the experiences, but there are several Early Years areas, including the RightZkeepers Residence, where they can dress up, watch a puppet show and bounce on a water trampoline, and the science lab, where they can make their own bubbly potions. There are lots of hands-on activities that are perfect for Year 1 and 2 children, including the aviation academy, where they can train as pilots or cabin crew, pit lane, where they work in teams to change the wheel of a racing car, and courier service, where they're in charge of following a map and delivering parcels to the various establishments around KidZania. If your child learns best through doing, they'll love the climbing building and the air conditioning technician activity, where they have to negotiate a network of tunnels to find and fix a fault. Children who love to perform can show off their skills as a singer or dancer in the disco. Being responsible for their own kidZos also means children are adding and subtracting money as they go, and making decisions about whether to take part in activities where they spend or earn money. They can choose to spend their kidZos either in the shop, or on activities such as facepainting, jewellery making and temporary tattoos. There's no shortage of curriculum-linked activities for older children. They can learn about how newspapers are produced by becoming reporters, heading out into the city and interviewing case studies before returning to the printing press, and brush up on their money management skills by working in the bank, or opening their own kidZos bank account, complete with debit card. There are also some brilliant STEM activities, including the recycling plant, where kids learn about how paper is recycled before making their own handmade paper, and the power company, where they learn all about electricity. They can even go to university and earn a foundation degree in medicine or engineering. KS2 children will love the freedom of exploring KidZania by themselves. On entry, every child and adult is issued with an electronic wristband, which means children can't leave the facility without their parents; you can also use these to see where in the city your child is, and to send them messages, so you know they're safe and accounted for at all times. It's hard to pinpoint a single unmissable activity, as different children will have different interests and priorities. Overall, though, the most popular experiences are the aviation academy, fire crew and chocolate kitchen. Because only small groups of around eight children can take part in the activities at any one time, there's a fair amount of queuing, so it's worth doing these activities early in the day when they're quieter. KidZania runs special events for Christmas and Halloween, as well as Easter and the school holidays. They also have events to mark festivals such as Thanksgiving, Pancake Day and Mothers' Day. There are several different eating areas within KidZania, including Gourmet Burger Kitchen, the Diner, which sells food such as pizza and pasta, a crepe stand, a sandwich kiosk and a juice bar that also sells pastries and hot drinks. Food is also available in the adults-only lounge. You can't bring your own food into KidZania. KidZania London, Westfield London, Ariel Way, W12 7GA. There is plenty of parking available at Westfield, although it's not cheap (we paid £9 for the duration of our visit). Shepherd's Bush, Shepherd's Bush Market, Wood Lane and White City tube stations are all within walking distance, as is Shepherd's Bush overground station. KidZania is on the first floor of Westfield, between M&S and Gap. On term-time weekdays, admission costs £29.50 for children aged four to 14, £16.50 for adults, and £10 for one- to three-year-olds. On weekends and in the school holidays, children's tickets are £32, adults £16.50, and one- to three-year-olds £10. Babies under 12 months are free. There are also reduced rates for two-hour late afternoon visits. In term-time, KidZania is open from 10am till 6.30pm on weekdays, 10am till 9pm on Saturday and 10am till 7pm on Sunday. In the school holidays, it stays open until 8pm on weekdays and Sunday. At the end of their visit, children can spend their kidZos in the department store, but be warned: prices are steep! The cheapest items are about 40 kidZos (a pack of two rubbers or a plastic ring). If you're planning a return visit, your child can save up their kidZos and earn more next time so they have a bigger budget. But given the prices, I'd recommend children spend their kidZos taking part in activities rather than in the shop: for example, they can make a bracelet or have their face painted for 15 kidZos. There's also a souvenir shop where children can spend real money. The fun of KidZania is all in the doing, but you can take a 360-degree virtual tour online. There are also printable colouring cards to download.